At this moment in time I am in a lot of pain at least 6+(out of 10) from just about every place possible, very cold legs going into spasms. Dizzy most of the time with a really bad head. My IBS has calmed down a bit but not as much as I would like it to. Physio today, Wietse and I talked about what has bean going on the past few weeks, even though I see him every week we often don't talk about RSD. I always tell him when tablets are changed or added to. I told him about my stomach, fine till I eat we both agreed its the dreaded IBS, maybe doc can give you some thing extra for it I said I would go next week. Today would have bean my Dad's birthday I still miss him very much if not more than I did. Life is so unfair. Docs today. He has given me MEBEVERINE tablets to take with the rest for the IBS flair up they should help. Blood test next week and a DEXTER SCAN very soon. I told him the RSD has probably spread he said he was sorry but try to stay positive. Today I went to Tommy Lee's first school play it was lovely and it mostly went to plan. To night we ( another member) are going to Pilate's in a different place (we are getting as lift with the teacher) as numbers are now down at the usual place, its the same teacher, the class is a bit more advanced than the normal one but we only need to do what we can, the session was very good and the different moves were challenging but good I managed most even the standing up ones. While another class was being taken we went for some chips they were extra good. It's the same fish and chip shop I used to go too when I was at secondary school in the village of Welton, all in all it was a good night. I was very tired as it had bean at eventful day and a long one. Physio today we talked about what the doctor had arranged for me. I had the usual acue. 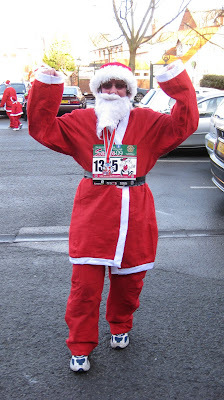 I asked Wietse if I could do a Santa fun run. 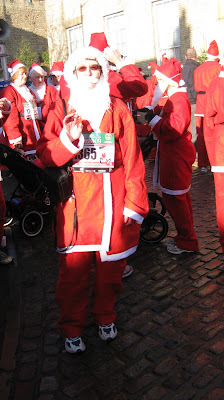 All the runners and walkers dress up in Santa suit and beards. I did run, well sort of, with a friend in October I did not mention it to many, as I was afraid it might not happen again, also I did not want any pressure from other people like asking how I am doing. and I did not want to get my hopes up I feel now I can try again, as it is less painful to run than walk. He said yes so long as I am sensible and not to do it if I have a bad day progress at last? Well today is the day I try to run. I have on my old running shoes last worn, for running for a race in 2004 and an active ankle support on my RSD leg, it should stop me from going over on it, its a 2.2 miles one so a short one, I hope. The day is sunny but cold so just about right. We all stand there waiting for the start, my husband Paul is doing the walk, then we are off. There are a lot of runners, 1500 in all. I needed to look where I was going and try to run; this was going to be hard. I started on the first lap, my foot does not bend or move from the foot its self so all the movement comes from the knee. Its a different style to say the least. 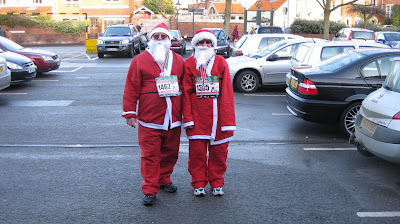 I am pleased, no more than pleased I was running in a race the second lap was easier than the first. I got round in 27 minutes 29 seconds. I did not stop the whole way as I knew if I did my hips would probably sieze up and I would have to stop. When I finished I just gently moved about. I received a medal the first one running since 2004( I have some I got when on crutches for 3 years) I was in tears as I did not think I would ever do this again. It felt so good. Could this be the start of a better stage in my life. Paul also finshed the race. So pleased pleased to finish. Ham strings feel a bit tight and I ache a bit but not as much as I thought I would, on the whole I am on a high. Today I have a blood test. The nurse tried twice to get blood it would not flow, she asked another nurse and she was successful. My arm was a bit sore. My neck is very tight with shooting pains from the bottom of my neck to the top of my head very very painful. Pilate's again at Welton last class this year then I will find out where it is going to be after that. Again different moves some I could do, some I could not. Chips again, a good night. 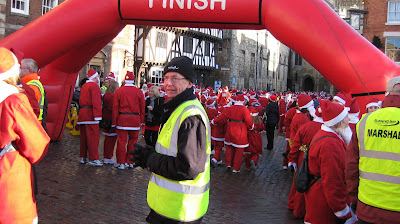 Physio Wietse was very pleased that I had a good Santa run ( my son Andrew has christened my run it a RALK a cross between a run and a walk). He did the usual acue and a massage on my neck and shoulders, the pain was crippling, and he had to keep stopping as I felt like the room was spinning. He said my neck was very tight and swollen the muscles were pressing on the nerves causing the recent pain. Andrew came with me today and watched and talked. Wietse was singing and smiling while he was doing the massage, he was very happy. He said I would feel the benefit in a few days I certainly did not at the time. I felt bruised and sore. My neck and shoulders feel like I have bean beaten with a baseball bat. Went to the Running Club cross country; I go to watch I wish I could join in. It's a very cold day with snow. Today I took off my blanket guard (it keep the covers off my sensitive foot) to see how my foot will react without it. When I first got into bed it started to play up, pain and spasms. I thought I would give my foot a bit of time to adjust. Luckily it did and the pain and sensitivity went. I dropped off to sleep only to be woken a hour later in pain, again I waited and it went away. Not bad for the first night. Doctors today. The results of my blood tests are good, iron levels are good for me, so no iron tablets needed. As I was getting my scooter out the house, I slipped on the ice and started to slide backwards with the scooter heading for me, I managed to stop with it resting on my feet still sliding backwards with the weight of it. I think it weights twice what I weight. I dare not move if I had I would have slipped off the kerb, closely followed by the scooter which would have landed on top of me. I would at least broken my ankles if not a lot more ( I have osteoporosis). Luckily a neighbour came out and rescued me. I was shaken up but played it down. Blanket guard still off foot still creating. Christmas day its very cold and frosty. Some very nice presents and a good dinner but a quiet day on the whole tomorrow however will be the opposite. A lot of burning in the heel of RSD foot, all my joints ache. It may be its tired as I'm not sleeping any better. Bad spasms in legs in the night. I have now put on my electric blanket it's very nice when I get in to a warm bed which I hope will help with my foot. Blanket guard still off nearly put it back on as pain was worse, but its a small step forward if I can keep it up. Temperature changes have bean all over the place and not a lot better but there is always next year to improve. This year has bean very mixed with things looking up then going very fast down again but maybe thing are changing for the better especially as I have had a small run. I don't like to look too far ahead as its usually brings disappointment but it would be lovely if I could run again. Five years ago three things I loved were taken away from me I thought they were all impossible to get back, so if I could run I would at least get one back. I would like to wish everybody a happy new year and hope it will be a better one, may even a very good one. Hi! Thanks for sharing your experience with me. My spasms aren't bad, it's the sensitivity that gets me with acupuncture. My feet are the worst, so any other place I can handle. Once the feet get involved, I get nervous. Only had three treatments, but my doc is a full holistic doctor, so we are working with hormones right now, too.